Friends, after much trial and error I’ve finally done it. 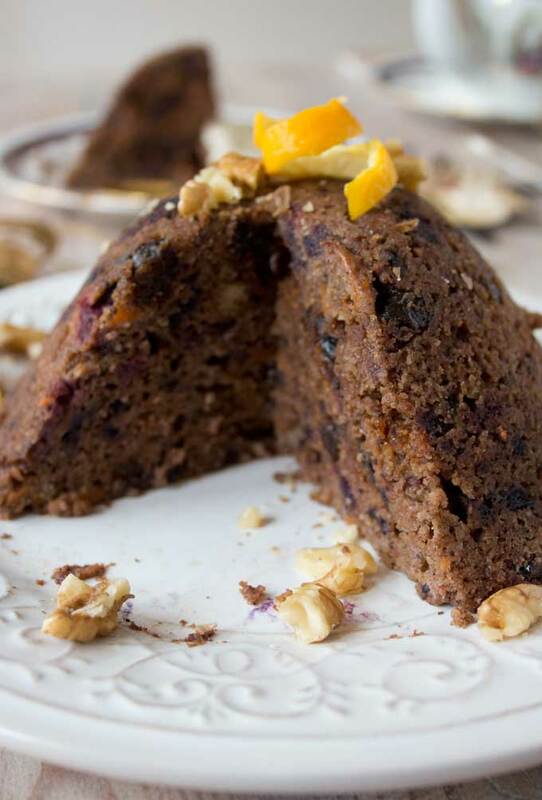 Here it is – an actually delicious low carb Christmas pudding! 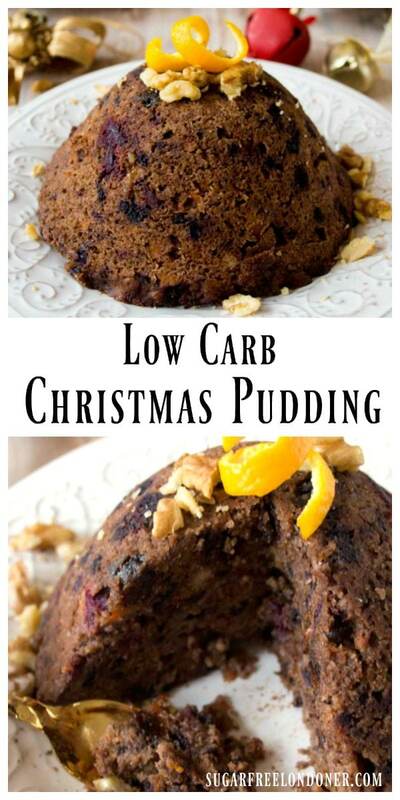 This low carb Christmas pudding recipe weighs in at 8 net carbs per person and comes together in just over 10 minutes. Yes! I made it in the microwave. We’re talking instant Christmas gratification here! 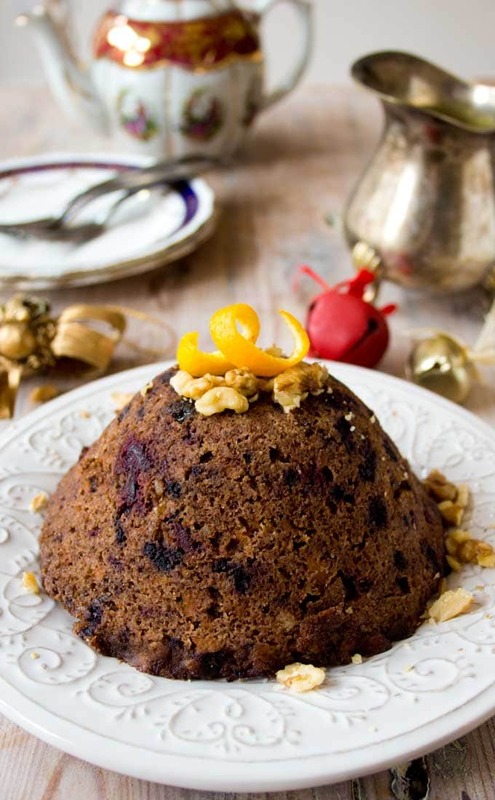 The single main ingredient of a Christmas or plum pudding is, as we all know, mincemeat. Dried fruit and candied peel is a tricky ingredient for people on a sugar free and low carb diet, as it’s, well, high in sugar and carbs and basically off the menu. 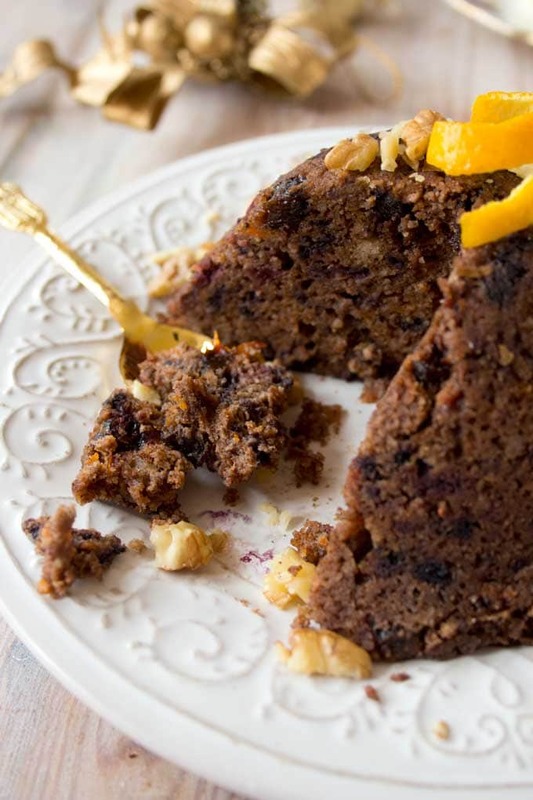 This easy Christmas pudding uses some clever substitutions. Are you ready? 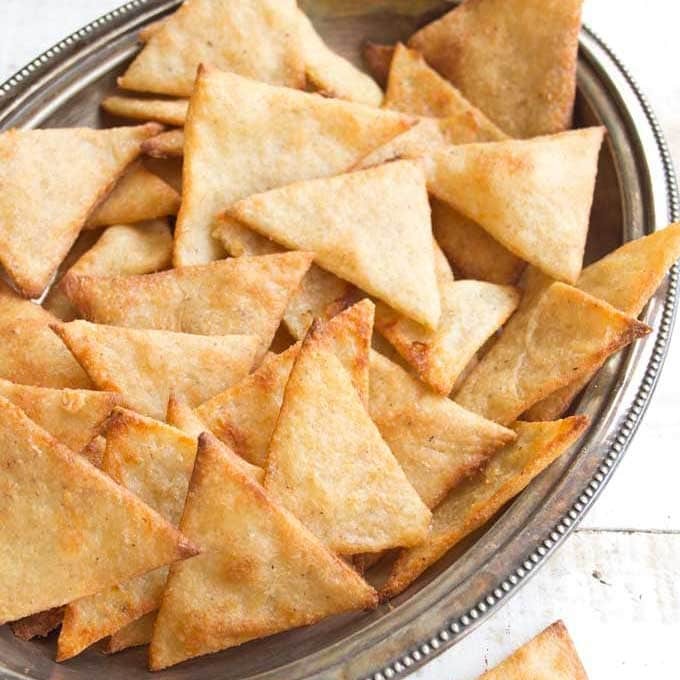 First of all, I replaced the flour with almond flour. 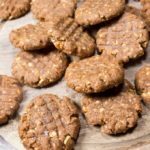 This was the obvious one – I’ve made LOADS of desserts low carb by making this simple swap. Sweetener – simples. Instead of sugar, I used my go-to sweetener erythritol. Mincemeat. I subbed with frozen blueberries and cherries. Both have plenty of natural sweetness and we’re keeping close to the traditional Xmas pud colour scheme. To bulk up the recipe, I added come carrot, which I shredded into small pieces in my food processor. 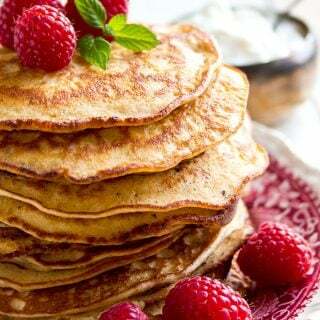 Lower in carbs and sugar than apple, which is often used in traditional recipes. 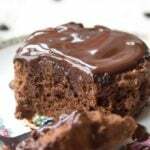 Stroke of genius – I threw in a spoonful of cacao powder to make the pud nice and dark. In hindsight, coffee would work nicely here, too. 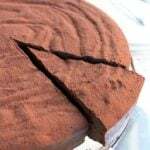 In one of my earlier attempts I had added double the amount of cacao, but found the result too chocolate-cakey. We want Christmas, not Cocoa, right? This cake is brimming with Christmas flavours! All the usual suspects are featured. Orange peel (real grated orange peel, not the candied version), cinnamon, mixed spice, walnuts, you name it. Brandy. A glug of brandy takes the recipe to the next level. A tiny word of wisdom here: I made this particular specimen late morning and basically had a slice for breakfast. This might NOT be a good idea depending what you have planned on doing after eating your Christmas pudding. I am a lightweight when it comes to alcohol and felt wonderfully warm and fizzy for a while. I cannot rule out that I imagined this, but MAYBE 6 minutes in the microwave is not enough to burn off the booze. 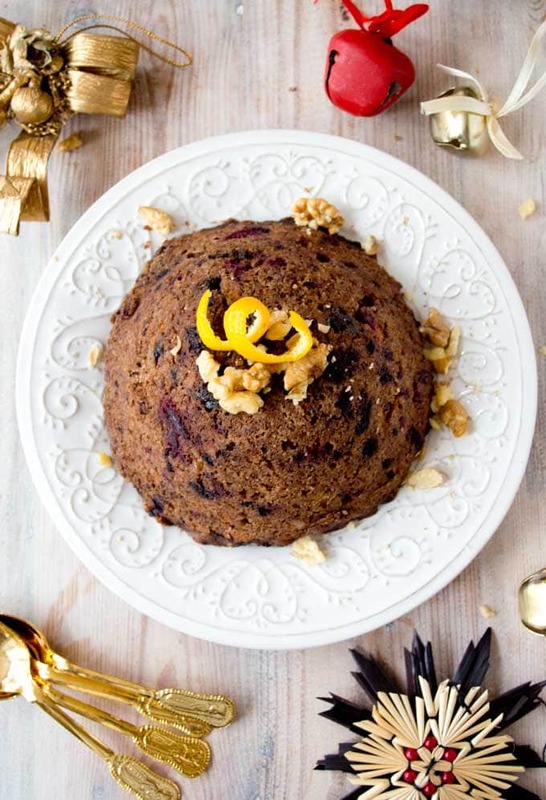 Here is the disclaimer: This low carb Christmas pudding does not taste EXACTLY like a traditional Christmas pudding, but it does come pretty close. 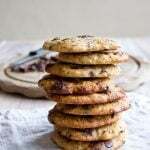 If you want, you CAN add dried fruit to the recipe. Prunes would be a good choice here. They are lower in carbs than dates, sultanas or currants. I think if you would add 1 prune per person you could probably taste a difference without sending your blood sugar sky-high. As a new microwave owner, I’m seriously pleased how this pud comes together in all but 6 minutes. I’m sure you could bake it, too – I’d try 180 Celsius and around 20 minutes. I ate my low carb luxury Christmas pudding with some extra-thick double cream. 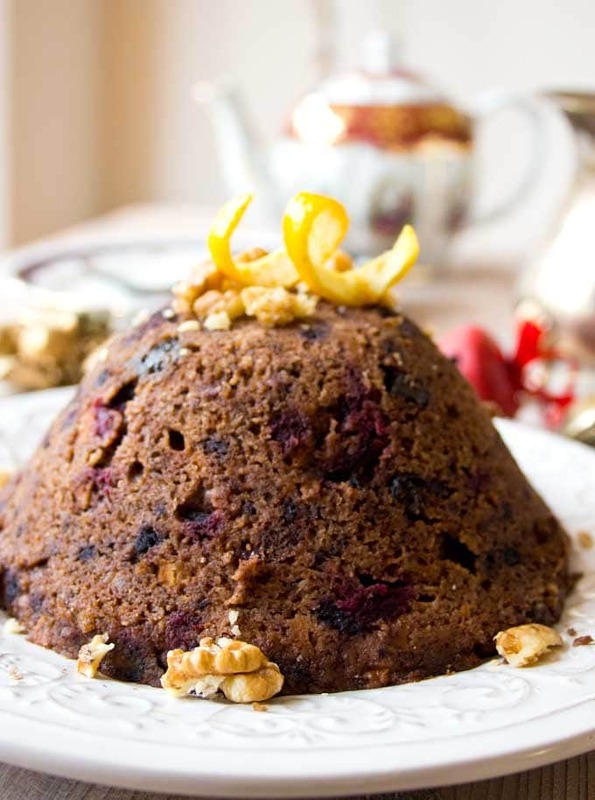 Enjoy this low carb Christmas pudding as the crowning glory of your festive meal. 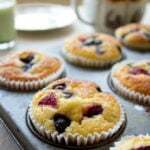 It's sugar free, gluten free and suitable for diabetics. Even better, it's ready in just over 10 minutes! Blitz the carrot in a food processor or grate them. Add the fruit (I used frozen blueberries and cherries) and chop. Your chopped carrots and fruit combined should fill 1 US measuring cup. Add the melted butter and all remaining ingredients to the bowl and stir until combined. If you wish, add a glug of Brandy. Adjust sweetener if needed. Grease a pyrex glass bowl with butter and fill in the Christmas pudding batter. Microwave at 700W for 6 minutes. Turn out upside down onto a plate and serve with thick cream. I have tried to keep this pudding as low carb as possible and avoided dried fruit, which arguably are the essence of a Christmas pudding. If you do wish to add dried fruit because it's Christmas and all that, I'd recommend prunes over sultanas - they are much lower in carbs. 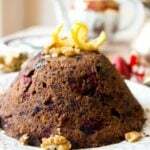 I made this recipe so I had some form of Christmas pudding and not feel left our whilst the others ate my mother’s traditonal home made delicious Christmas Pudding. And I am so glad i did as it was a great replacement, didn’t feel deprived at all. And am certainly not waiting until Christmas to make it again. Thank you SO much for this recipe. As a Catalan I don’t know how a Christmas pudding should taste, but I doubled the batch, used prunes, and cooked it in the oven for 50-60 min. 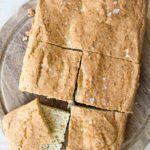 I brought it to a lunch and my Yorkshire friends went amazed it was sugar and gluten free! 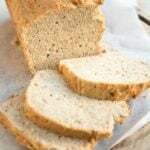 They loved it so much that I’m planning to do it again when I go back their home and I’ll keep your recipe as a staple. I added 2 tsp of molasses for flavor (I know there’s sugar in there but it was a small amount), turn out great. I guess if I cooke it in the microwave the texture it’s more like pudding, coked in the oven, though, it’s like Christmas cake (without the marzipan and the glaze): Incredibly delicious! Wonderful! Thank you so much for all the details of your tweaks. Merry Christmas Katrin! This is our first keto Christmas for my wife and I and we have pretty much stuck to it. I did cave in and have some roasted parsnips with Christmas dinner yesterday though! We made your pudding last night and thoroughly enjoyed it. We used to love Christmas pudding but we both said this is better as it doesn’t give you that stodgy feeling afterwards. Perfect – thank you! I’ve never tasted Christmas pudding, but this is really delicious! I used cranberries in mine instead of cherries, because that’s what I had on hand. 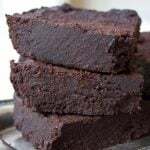 It’s moist and full of flavor and perfect for breakfast or dessert! Thanks for the recipe! Hi, Katrin! I would love to try this recipe. What size pyrex bowl did you use? Thank you! Hi! It had a diameter of 14 cm. Can you tell me how many people this serves please. One question–any thoughts on how to make a low carb keto hard sauce for it? This is amazing big hit xmas day. Everyonw loved it. 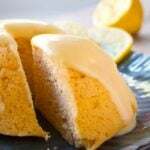 I baked mine in oven 25 – 30 minutes served with custard made with honey. Delicious!!! Did you know they used to use softened onion instead of Apple during the wars? No idea! Don’t they say that without sight or smell you cannot tell the difference between onion and apple?!! It’s definitely best with booze! You are so welcome!! That sounds like a no-nonsense brandy butter! Hi, I was hoping to make this for Christmas but we don’t own a microwave. Do you think I could use oven or stovetop here and any ideas on times and how to? Thank you so much – it looks delicious. Thank you for the oven temperatures and time. I don’t know much about microwaves. Yay for healthier holiday desserts!! Thank you so much I do miss Christmas pud! I’ll be in Gran Canaria for Christmas and I doubt I can find cherries there (blueberries, possibly). So I’ll have to see if I can find any still low-carb substitute, or maybe take some prunes with me and just use those. But I wonder, if I add the brandy, would that keep the pudding good for a few days? Then I could make it before flying. I’ve just made this and it’s delicious! I used more sweetener and also added 1 tsp of instant coffee. And no Brandy – not my kind of thing. Thank you for posting this. So glad you like the recipe. THanks for your comment! Can you taste the carrots? How small are the carrot pieces? The carrots give extra sweetness. I ground them in my food processor so they were the size of say couscous or cauliflower rice. I’m so excited about this recipe. Making it this weekend. Thank you!! Good stuff! Would love to find out what you think!